Growing up, I was lucky enough to not face many food battles because I happened to like the food my parents made (most of the time). But when confronted with the remnants of a bowl of raw cake batter or a fresh batch of raw cookie dough, I’d wage a full-scale rebellion against the advice of my elders and lick/eat the heck out of those sweet treats, despite the threat of salmonella poisoning. Turns out it might not have been that risky of a business. Slate’s L.V. 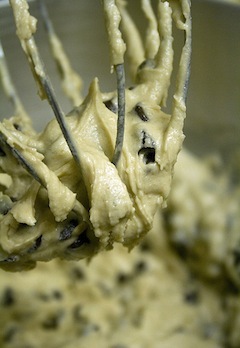 Anderson edits the site’s food and drink sections and writes that she’s had a long history of licking raw batter and eating dough in her baking experience through the years, and not once has she gotten salmonella. While that seems to fly in the face of all the warnings your parents, grandmas and anyone else would tell you about eating raw eggs, Anderson dug into the legend of egg salmonella, and came to the conclusion that you’re probably going to be just fine licking that spoon. The paranoia over salmonella poisoning in eggs started in the mid- to late 1980s during egg-associated outbreaks of salmonella in the northeastern United States. Because Salmonella Enteritidis, the subtype of salmonella that usually causes salmonella poisoning, doesn’t produce visible symptoms in egg-laying hens, it can pass through henhouses sneakily and doesn’t show up until consumers catch it and complain. The outbreaks killed dozens of people and sickened hundreds more, prompting egg producers to change their prevention methods and keep salmonella transmission among hens down using various measures. Pennsylvania was on the forefront of this movement with its Pennsylvania Egg Quality Assurance program, and many other states followed. The amount of salmonella-infected henhouses was considerably reduced from 38% to 8% in Pennsylvania and other voluntary programs showed similar results. It’s still a danger, with an outbreak in Iowa henhouses in 2010, but federal restrictions have also tightened at the same time, at a great benefit to consumers. In addition to bringing down the amount of henhouses infected with salmonella, it’s also rare to catch it from eggs for other reasons: Even if a hen is infected, it might not always lay infected eggs. Using data from the 1990s, the Centers for Disease Control and Prevention estimate that one in 20,000 eggs is internally contaminated with salmonella. With all the improvements that has have happened since then, it’s likely that the number is even lower now. And if you do get an infected egg in your kitchen, keeping it at or below room temperature will keep that bacteria from growing. It’s when you leave an egg out on the counter that the salmonella can really tuck in and feast on all those eggy nutrients. If it’s kept at the right temperature, it’s likely that any salmonella in an egg would be small enough that you wouldn’t even eat it while licking a spoon, and that the infected part would just get baked out in the oven. Even if you do eat a little bit of the bacteria, your body will probably be able to fight it off. “Salmonella, like a lot of food-borne bacteria, are what we think of as opportunistic organisms, in that they really don’t compete very well with a lot of other bacteria and microbes that are not only in nature, but also are in the human intestinal system,” David McSwane, a retired public health professor at Indiana University and the co-author of Essentials of Food Safety and Sanitation, told Anderson. Of course it’s always good to be careful because if you do eat a lot of salmonella, your gut won’t save you — especially if you’re a child, elderly, pregnant or have any immune-compromising medical condition. It’s best to eat pasteurized eggs, if you’re worried. When it comes down to it — and we’re no doctors or health experts — if you want to lick that spoon, go for it. You’ll probably be okay.